The School Safety Advocacy Council Training is pleased to announce the opening of the first of its kind, Online School Safety Training Academy. For the first time in the United States, School Resource Officers, School Administrators, School Based Security Professionals, Counselors and others will be able to enroll in school/campus related safety courses from the comfort of their office or home. For Law Enforcement Agencies and School Districts, this equates to savings of important funds that can best be used on other strategies. In addition, schools won’t have to have key safety staff off-campus for training, as they can take the class from their office and still be available to respond in the event of an emergency. And best, the cost will be almost 50% less than having to enroll in a regular course. Question: Will I get a certificate for this course online? 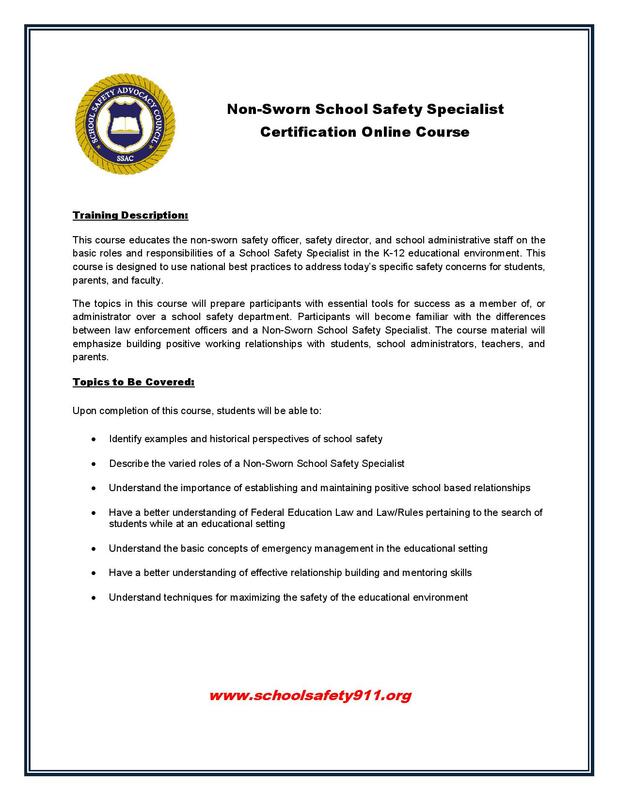 Answer: YES, and all courses are credentialed through the School Safety Advocacy Council Training Committee and upon successful completion of the course, you will be able to print out a certificate. Question: Can both certified and non-certified law enforcement and school administrators take the courses? Answer: YES, this and other courses soon to be released will be geared to both school administration and law enforcement as our course instructors and designers truly look at the partnership model as being the most effective in terms of school safety. Question: How do I go about registering and starting the course? Answer: Each attendee must register and pay separately and then create a short profile. Having this individual profile will allow the student to sign in and out of the course as your work day permits. Question: If my police agency or school district wants to pre-purchase several student registrations, can we do that with one credit card or a purchase order? Answer: Yes, if you work for a larger agency or district and you would like several authorization codes, you may simply call our online office at 877-360-0155 extension 8 and our staff will assist in processing the multiple registrations for you. Question: When will more courses be offered? Answer: Soon, our course writers are busy at work finishing several new courses that will appeal to a broad section of the school safety field. Stay tuned and check back often. Question: Because networking in the training field is so important; will there be any opportunities for those who take the course to network in person with others in our field? Answer: Yes, the School Safety Advocacy Council is the recognized leader in School Safety & Anti-Bullying related training in North America. As such, any paid attendee of the online Basic SRO Course and the Non-Sworn Safety and Security Certification Course (release date July 1st, 2016) will be given a 25% discount to both the National School Safety Conference and/or the National Conference on Bullying. Question: How will taking this course online differ from taking the course in a real classroom? Answer: Well for one, you are able to take the course for less than 50% off the tuition, not to mention there are no hotel bills, mileage costs, air travel, meal costs etc.. 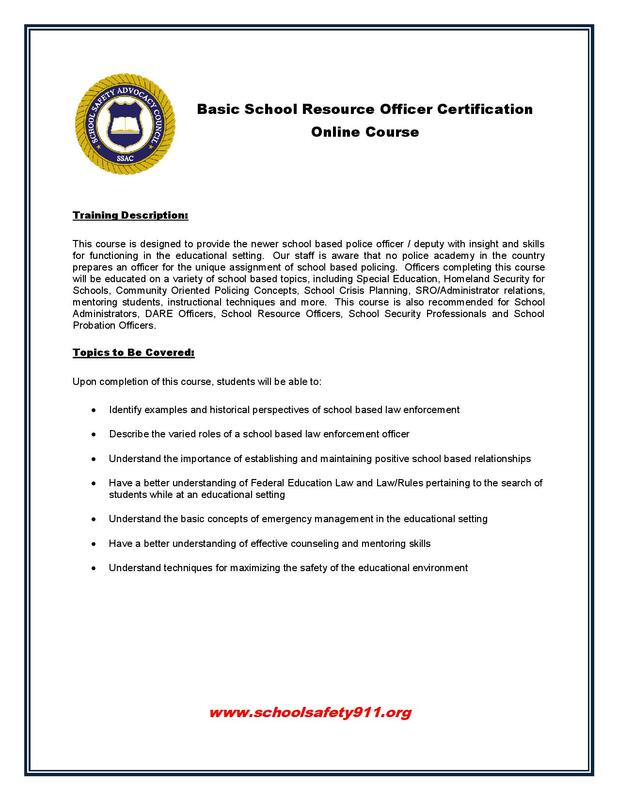 In addition, there is no loss of personnel who the SRO or Administrator is taking the course. They can simply log in and take the course from their office at their convenience. In an important incident arises, they are onsite and can respond immediately. Lastly, the course was designed by the nations top SRO / School Administrator Instructors who have over 25 years teaching this course. Question: Is there any other benefit from taking this course online? Answer: Yes, one of the biggest areas our team identified in taking this online course is liability. We recognized that many attendees take a classroom course of this nature and are given post class assignments such as review the school’s crisis plan or review the school’s evacuation plan and site. After the classroom student has completed the course, there is no way for an agency to verify these critical tips were ever completed. With the online class, each attendee will be given numerous assignments for which they must complete and acknowledged having completed in writing. Graduates from the online course will be better prepared to handle the unique job in which they are about to take on. Staff can customize any of our training courses or modules to fit your school/agency needs. SSAC can typically work within your budget to deliver the most comprehensive training available nationwide.